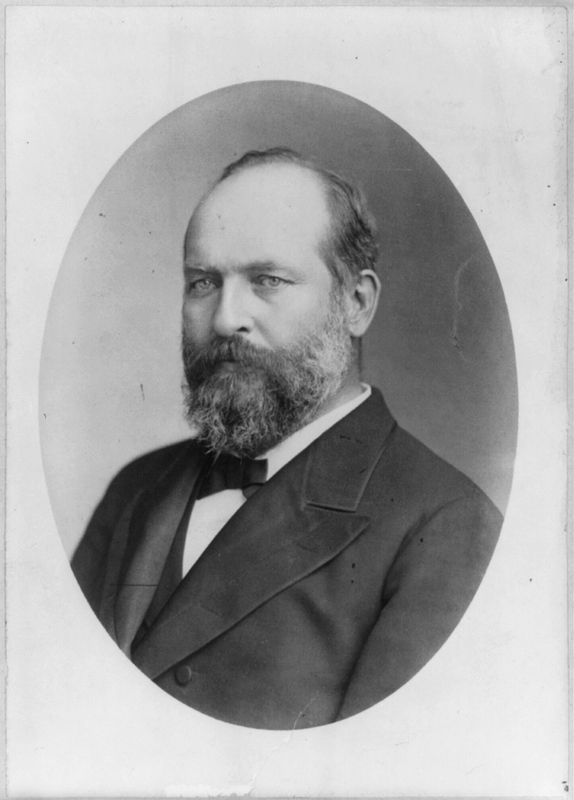 One-hundred and thirty-two years ago today—on July 2, 1881—the 20th president of the United States, James A. Garfield, entered the Baltimore and Potomac Railroad Station in Washington, DC to board a train bound for Williamstown, Massachusetts. 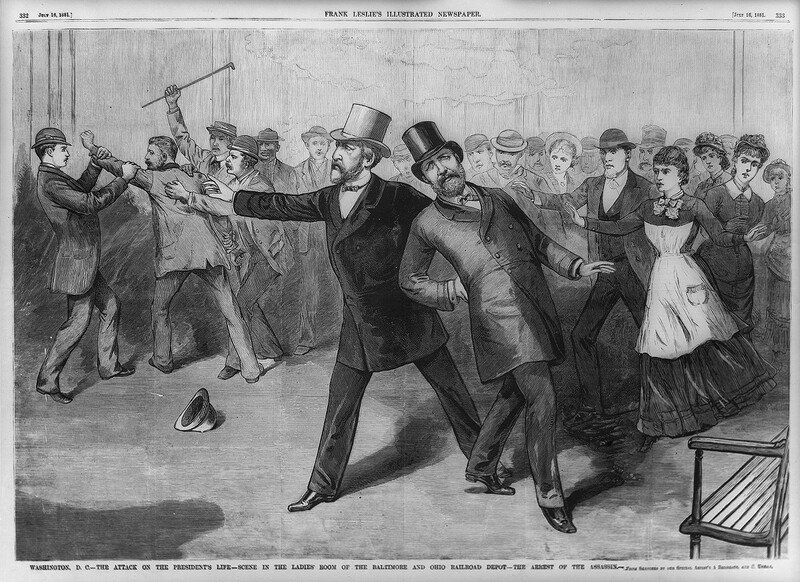 Charles Guiteau, who was angry that Garfield failed to appoint him to a diplomatic post and believing that God was instructing him to kill the President, stepped toward Garfield from a station door and fired two shots. One bullet grazed the President’s right arm. The second bullet entered his lower right back. As bystanders seized Guiteau, Garfield collapsed onto the floor, mortally wounded. Within an hour after the shooting, a group of notable physicians assembled to take over the President’s case. Their prime concern was the bullet still lodged in Garfield’s abdomen. It was this bullet and the path that it took through Garfield’s internal organs that would haunt the doctors that attended him. Garfield received the very best in medical care of the time, but in 1881 the germ theory of disease was not yet established in America. There were no CT scans, PET scans, or even x-rays. There was no blood typing, and blood transfusions were rarely successful. Abdominal surgery was seldom attempted since it was almost always fatal. The best that doctors could do for the President was to probe his wound to determine the path of the bullet and, therefore, the extent of his injures, dress his wounds, provide him with nourishment, and make him comfortable. Many did not expect the President to live for more than a few hours, but Garfield surprised them all by surviving throughout the night and waking cheerful and rested. Now despite the seriousness of Garfield’s wound, there was hope. The doctors’ medical experience during the Civil War had shown them that some could survive wounds similar to Garfield’s, and Garfield was a relatively young and athletic man who was always playful with his children. America—and eventually the world—reacted to Garfield’s attempted assassination with deep despair. The President’s physicians issued daily progress reports which the public eagerly awaited and newspapers quickly reprinted for their readers. Letters by the bushel basket came daily to the White House offering advice on various forms of treatment. The famous American inventor, Alexander Graham Bell, volunteered to come to Washington and help with Garfield’s case. Yet, despite the care of prominent doctors and the heartfelt concern of the American people, Garfield would fail to recover from his injuries. This series of blog posts is based in part on research completed for a 2006 temporary exhibition at the National Museum of Health and Medicine commemorating the 125th anniversary of the assassination of President Garfield. However, this summer, we invite you to experience the aftermath of the Garfield assassination in a way that was not part of that exhibition: through the series of bulletins that appeared regularly in newspapers across the country in the summer of 1881. Millions of Americans read these bulletins in newspapers large and small, following the drama involving Garfield and the medical care he received from his doctors. Beginning today they will appear here—in real historical time—for the first time since they were originally issued one-hundred and thirty two years ago this summer. Many of these original bulletins, in manuscript and printed form, are held in the archival collections of the NLM, specifically within the papers of Joseph Janvier Woodward (1833-1884), one of President Garfield’s attending physicians. The entire set of the published bulletins are in the NLM’s copy of Charles A. Wimer’s Complete Medical Record of President Garfield’s Case (Washington, DC, 1881), which also contains a rare set of photographs of the President’s spine, taken following his death. All of this material, combined with sources held by the Library of Congress and the National Museum of Health and Medicine, opens a new window onto the aftermath of Garfield’s assassination. Jeffrey S. Reznick, PhD, is Chief of NLM’s History of Medicine Division and author of two books and numerous articles on the cultural history of war and medicine. Lenore Barbian, PhD, is Associate Professor and Anthropology Program Director at Edinboro University of Pennsylvania. She is author of numerous articles, including “Remains of War: Walt Whitman, Civil War Soldiers, and the Legacy of Medical Collections”, co-authored with Jeff Reznick and Paul Sledzik, which received the 2013 best article award from the Archivists and Librarians in the History of the Health Sciences (ALHHS).